But first…. Ooommmm…. Sing, Chant and Dance at Bhakti Fest! Last weekend I cruised down Ocean Boulevard to meet a friend near the 3rd Street Promenade at Bhakti Yoga Shala studio to experience the community and a class led by the founder, Govind Das. Michael had just finished a 50 hour training at the studio and spoke super highly of the community, the vibe, the teachers and more. So, I dawned my bell bottomed Teeki pants to inspire my inner hippie mermaid soul to let loose on the mat. As it turns out, I was in for a super sweet treat (that actually didn’t need to be accompanied by any specific outfit). The community was authentic, lovely and vibrant. And, to tell you the truth, I really had expected a bit more of a put-on spiritual feel. So, it was such a pleasant feeling to interact with the other yogis and be greeted by the clear eyes and easy smile of Govind Das himself while in the courtyard in front of the studio. The chatter between fellow yogis built and continued well before and after we got on our mats to build heat in our bodies and our souls. Singing and chanting while holding asanas (poses) lead by the teacher and the lovely voice of his wife, Radha, sitting upon the stage along with a drummer, brought an extra element of beauty and pure celebratory joy to the class. The final moments of dancing around to the music evoked wide smiles and giggles from within me. The voices and energy that filled the one room studio went beyond the om in creating a uniting vibe. I loved every minute. So, after the class, while chatting with some of Michael’s fellow yogis, who were heading to the Bhakti Fest in part to practice with Govind Das again, I decided that I definitely had to check it out, so that I could experience this feeling of freedom and happiness all weekend long! The 7th Annual Bhakti Fest is poised to be a truly transformational event. From September 9-14 the preeminent sacred music and yoga festival will host top Kirtan stars, sacred music, meaningful workshops, premier yoga teachers to bring “spiritual and earthly empowerment” to thousands of yogis, “sacred conscious explorers”, as well as global recipients of the nonprofit festival’s charitable endeavors from the U.S. and around the world in Joshua Tree, CA. Bhakti Fest (a.k.a. 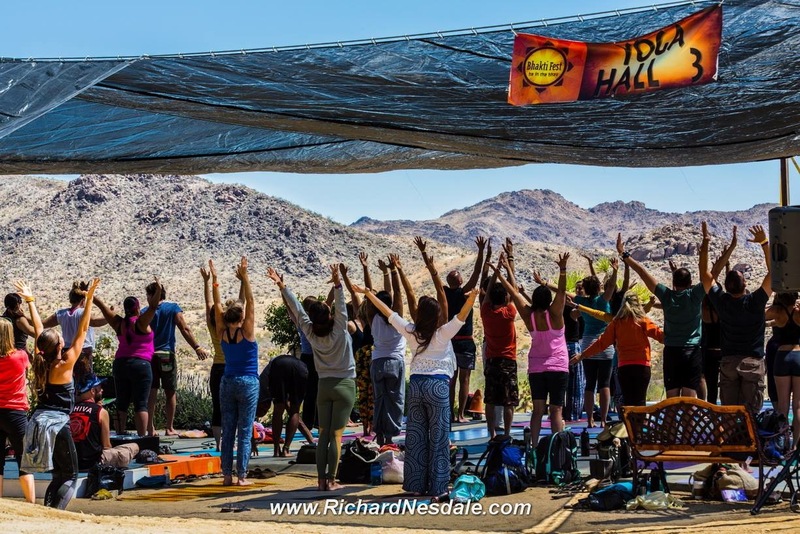 “The Spiritual Woodstock of The New Millennium”) will offers nonstop sacred music performances on two stages at the Joshua Tree Retreat Center, with Kirtan/chanting mixed in with a wide of variety of musical genres including blues, rock, pop, gospel, traditional, and hip-hop. Bhakti Fest is a festival series that celebrates the devotional path that stems from yoga, Kirtan, and meditation. It embraces ancient and modern sacred wisdom and traditional and non-traditional spiritual practices. All the artists, presenters, and vendors embody, practice, and share the spirit of Bhakti in a variety of ways, e.g. 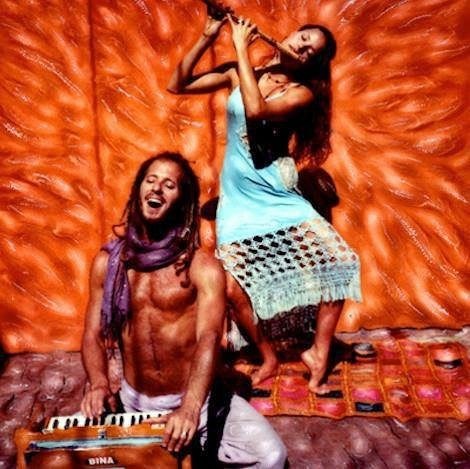 Kirtan, yoga, meditation, prayer, fire ceremonies, workshops, eco-friendliness fostering a holistic marketplace, eating healthy vegetarian cuisine, and participating in a wellness sanctuary that includes massage, bodywork, energy work, intuitive readings, and other unique life enhancing modalities. Bhakti Fest encourages spiritual service, or “seva,” and offers a work exchange program. Kirtan and reggae influenced singer/songwriter Trevor Hall, known for his hits “Brand New Day,” “The Lime Tree,” “Unity,” and others will headline the event. Other returning headliners include Grammy nominee Krishna Das who will perform one of his last shows before taking a sabbatical; Jai Uttal, with a high energy reggae and ska-influenced Kirtan set; revolutionary hip-hop artist MC YOGI; and long-time Madonna collaborator Donna De Lory. Other musicians include Kirtaniyas, DJ Drez & Marti Nikko, Saul David Raye, David Newman, Sean Johnson & the Wild Lotus Band, Govind Das & Radha, Gina Sala, Karnamrita, Brenda McMorrow, Gandharvas Kirtan, Girish, Larisa Stow & Shakti Tribe, Sri Kirtan, and Pranja Vieira. Festival goers will share sacred space with the world’s finest teachers of spiritual knowledge, yoga, dance, and breathwork throughout the twelve hours of daily yoga classes in 4 different venues, facilitated by incomparable teachers such as; Shiva Rea, Sianna Sherman, Saul David Raye, Yogi Cameron, Mark Whitwell, Kia Miller, Joan Hyman, Derek Beres, Tim Miller, Jennica Mills, Bhava Ram & Laura Plumb, Missy Balsam, Jessica Winderl, Erica Burkhalter and Kristin Olson. Bhakti Fest will also offer a myriad of workshops, including three sessions taught by Indian spiritual leaders Swami Chitanand from Rishikesh, Murti scholar Manoj Chalam, and fourth generation Ayurvedic doctor Yogi Dr. Amrit Raj. Presenters include Radhanath Swami, philanthropist and author of The Journey Home, and breathwork phenomenon Michael Brian Baker. And in tradition, the festival will grace festival goers with an exclusive interview with Bhakti Fest elder, and spiritual icon, Ram Dass, whose book Be Here Now helped bring Eastern philosophy to the West in the 1960s. To top it off there will be a healing sanctuary with massage, bodywork, energy work, and other wellness enhancing modalities, which I personally cannot wait to indulge in. Too keep your bodies clean and energized Bhaktis can feast on a variety of raw, vegan, and vegetarian food and beverage options. And, we’ll be able to shop guilt-free with the eco-friendly, sustainable vendors who will be offering yoga gear, clothing, devotional art, musical instruments, CD’s, crafts, jewelry and more. Bhakti Fest’s own Bhakti Shoppe will bringing a touch of India by feature highly sought-after items from the bazaars of India. Get your tickets, come for a day or come for all six. You can book a room, plan to camp or even “glamp.” But, get there. You’ll be bound for a transformative ride! We hope to sing and dance with you at Bhakti Fest. Bhakti Fest is a vegetarian, family friendly, safe environment free of alcohol and drugs. Children 12 and under are allowed in for free and there is a specific Conscious Kids Land, where children can take part in music, yoga and enlightened play. The Joshua Tree Retreat Center offers the perfect setting for inner reflection and spiritual reconnection, with its natural high desert beauty. Accommodations on site include dorm-style communal space, camping, and RV parking. There are also several hotels within a few miles of the retreat center. *Bhakti Fest is a nonprofit 501c3 organization and accepts tax-deductible donations. The festival donates a percentage of its funds to charities and other nonprofit groups that provide food, education, and environmental beautification programs around the world. These include Food for Life Vrindavan, Love Serve Remember Foundation, Ramana’s Garden, Seva Foundation, Share Your Care, and Woman’s Earth Alliance.